Take this first step in the pathway to your new career. 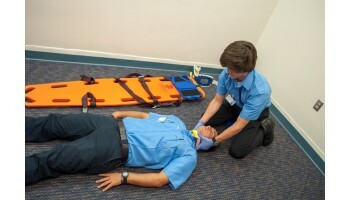 EMT is a state required course for ambulance personnel, fire rescue, life rescue, lifeguards, and ski patrols. Students will learn first aid and life-saving skills for trauma and medical conditions such as shock, respiratory and cardiovascular emergencies, immobilizing injured limbs, and assisting with emergency childbirth. The ambulance ride-along is part of the course requirement.